The multi-information display shows warnings of system malfunctions, incorrectly performed operations, or shows messages that indicate a need for maintenance. The master warning light also comes on or flashes in order to indicate that a message is currently being displayed on the multi-information display. If any of the warning messages is shown again after its correction procedure has been performed, contact your Toyota dealer. The site of malfunction is shown flashing on the display. After taking the specified steps to correct the suspected problem, check that the warning message goes off. The system also indicates which doors are not fully closed. If the vehicle reaches a speed of 3 mph (5 km/h), flashes and a buzzer sounds to indicate that the door(s) are not yet fully closed. Make sure that all the doors are closed. Indicates, if the vehicle reaches a speed of 3 mph (5 km/h), that the parking brake is still engaged. A buzzer also sounds. Stop the vehicle in a safe place, shift the shift lever to “P” and wait until the light goes off. If the light goes off, you may start the vehicle again. If the light does not go off, contact your Toyota dealer. A buzzer also sounds. Check the level of engine oil, and add if necessary. This message may appear if the vehicle is stopped on a slope. Move the vehicle to a level surface and check to see if the message disappears. Check the tire inflation pressure, and adjust to the appropriate level. Indicates that all maintenance according to the driven distance on the maintenance schedule* should be performed soon. Comes on approximately 4500 miles (7200 km) after the maintenance data has been reset. Indicates that all maintenance is required to correspond to the driven distance on the maintenance schedule*. *: Refer to the separate “Scheduled Maintenance Guide” or “Owner’s Manual Supplement” for the maintenance interval applicable to your vehicle. Check the grille and the sensor and clean them if they are dirty. In case of overheating, the system will become functional once the system cools down. Indicates that the precollision system is not currently functional due to overheating. Indicates that remaining fuel is about 4.0 gal. (15.0 L, 3.3 Imp. Switch driving mode to either normal or power. If the windshield wipers are on, turn them off or set them to either intermittent or slow mode. A buzzer also sounds. Slow the vehicle by applying the brakes. Have the malfunction repaired immediately. The electronic key was carried outside the vehicle and a door other than the driver’s door was opened and closed while the “ENGINE START STOP” switch was in a mode other than off. Bring the electronic key back into the vehicle. The driver’s door was opened and closed while the electronic key was not in the vehicle, the shift lever was in “P” and the “ENGINE START STOP” switch was not turned off. Turn the “ENGINE START STOP” switch off or bring the electronic key back into the vehicle. An attempt was made to start the engine without the electronic key being present, or the electronic key was not functioning normally. An attempt was made to drive when the regular key was not inside the vehicle. Start the engine with the electronic key present*. The driver’s door was opened when the shift lever was not in “P” and the “ENGINE START STOP” switch was not turned off. Shift the shift lever to “P”. The driver’s door was opened and closed while the electronic key was not in the vehicle, the shift lever was not in “P” and the “ENGINE START STOP” switch was not turned off. Bring the electronic key back into the vehicle. When the doors were unlocked with the mechanical key and then the “ENGINE START STOP” switch was pressed, the electronic key could not be detected in the vehicle. 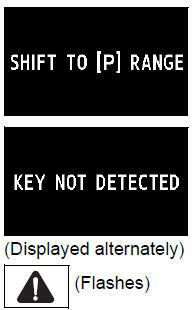 The electronic key could not be detected in the vehicle even after the “ENGINE START STOP” switch was pressed two consecutive times. Touch the electronic key to the “ENGINE START STOP” switch while depressing the brake pedal. The electronic key has a low battery. Replace the electronic key battery. A door was opened and closed with the “ENGINE START STOP” switch turned off and then the “ENGINE START STOP” switch was put in ACCESSORY mode twice without the engine being started. Press the “ENGINE START STOP” switch while depressing the brake pedal. 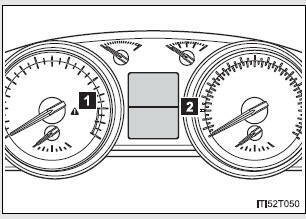 The steering lock could not be released within 3 seconds of the “ENGINE START STOP” switch being pressed. Press the “ENGINE START STOP” switch while depressing the brake pedal and moving the steering wheel left and right. If the following message is displayed, take appropriate action and confirm that the message has disappeared. Select the four-wheel drive control switch in L4 and shift the shift lever to “D” or “R”. Confirm the operating conditions to operate Turn Assist function. Turn on the Crawl Control switch to operate Turn Assist function. After adjusting the tire inflation pressure, be sure to initialize the data. If the message remains on, the system may have malfunctioned. Have the vehicle inspected by your Toyota dealer as soon as possible.